Introducing Mark Patraw's paper action figure. The character is Katt from Breath of Fire 2. 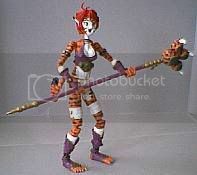 She was made using cardboard from a cereal box, newsprint, colored paper, a plastic broom bristle, Kleenex, wire twist ties, white/hot glue, and acrylic paint. This guy is GOOD! Did I mention she have 54 point of articulation? You can read about the details here. You can also visit his art page at Mark's Art Page. Be sure to visit his Master Figure section. Man, I got to try making something like this!